Click image to enlarge Deer Island, Oregon. Deer Island, Oregon, as seen from Oregon Highway 30 near Tide Creek. Image taken October 31, 2006. Deer Island is a large island nearly 5 miles long and 2 miles wide, encompassing over 3,000 acres, and is located on the Oregon side of the Columbia River beginning at River Mile (RM) 77. Directly across the Columbia from Deer Island is Woodland, Washington, and Martin and Burke Islands. Downstream lies Goble, Oregon, and upstream lies Columbia City and St. Helens, Oregon. Just off the east shore of Deer Island lies Goat Island. 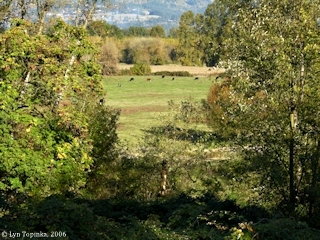 Deer Island is one of the few remaining large islands in the Lower Columbia area that has remained largely undeveloped. The island, which contains sloughs and lakes interspersed with grassy marshes and pasture, receives heavy use by wintering waterfowl as well as bald eagles, purple martins, and a variety of other wildlife. Lewis and Clark referred to this island as "E-lal-lar Island" or by the translated name of "Deer Island". The town of Deer Island, located on mainland Oregon, was named for the island. The Deer Island Post Office was established in 1887. On November 5, 1805, the Lewis and Clark expedition stopped on Deer Island to dine. On the Corps' return trip in 1806, the men camp on Deer Island. 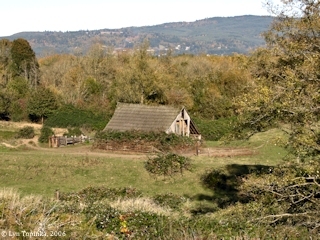 While Lewis and Clark spent the night of March 27, 1806, near Goble, Oregon, a group of hunters spent the night on Deer Island, near an old Indian Village on the northeast side. Early on March 28, 1806, Lewis and Clark met their hunters who had spent the night on Deer Island. The men then stopped and spent the day repairing canoes and drying equipment. They camped near an old Indian Village on the northeast side of Deer Island. 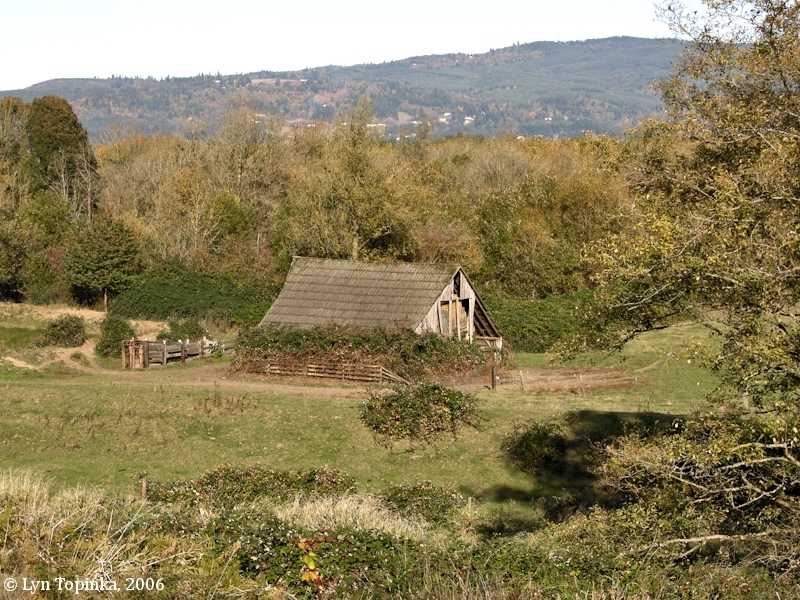 Lewis and Clark's previous campsite was near Goble, Oregon. 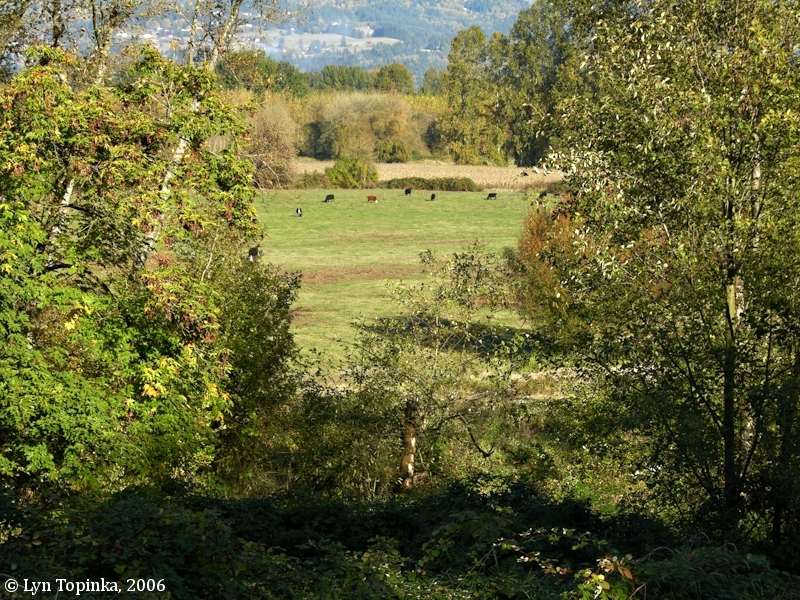 Their campsite of March 29, 1806, was called "Wapato Portage", and was located near a Cathlapotle Village, now located within the Ridgefield National Wildlife Refuge. "... DEER ISLAND, 34.2 m. (48 alt., 75 pop. ), is a small community opposite the island of the same name visited in 1805 and again in 1806 by Lewis and Clark. The naming of Deer Island is thus accounted for in the report of Lewis and Clark: "We left camp at an early hour, and by nine o'clock reached an old Indian village.... Here we found a party of our men whom we had sent on yesterday to hunt, and who now returned after killing seven deer in the course of the morning out of upwards of a hundred which they had seen." ..."
Click image to enlarge Deer Island Store, Deer Island, Oregon. View from moving car heading north on Highway 30. Image taken September 4, 2011. 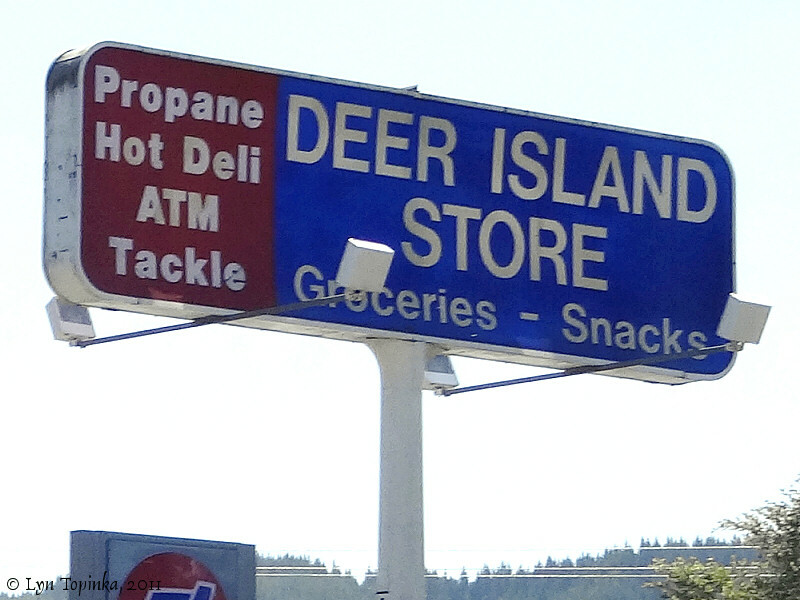 Click image to enlarge Sign, Deer Island Store, Deer Island, Oregon. View from moving car heading south on Highway 30. Image taken September 2, 2011. Deer Island Slough is a 6-mile-long backwater channel of the Columbia River and separates the western side of Deer Island to the adjacent floodplain. A dike was constructed about at the mid-point of the Slough and completely separates the slough into a northern and southern section, known as North Deer Island Slough and South Deer Island Slough. Water levels are regulated by tide gates located on the northernmost and southernmost ends of the two sloughs. 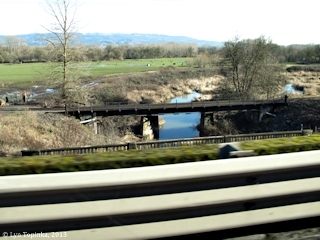 Merrill Creek, nearly 8 miles in length, is a tributary of lower Tide Creek and enters Tide Creek approximately one mile upstream from Tide Creek's confluence with South Deer Creek Slough. According to Oregon Geographic Names (McArthur and McArthur, 2003), Merrill Creek was named after Geroge Merrill who settled on Deer Island in 1851 and filed a Donation Land Claim. Merrill Creek rises in the hills west of Deer Island. The U.S. Bureau of Land Management's General Land Office (GLO) website (2012) shows George and Ann Merrill being granted title to 640.68 acres of T5N R1W, sections 4, 5, 8, 9, 16, and 17, on June 16, 1868 (1850 Oregon-Donation Act). 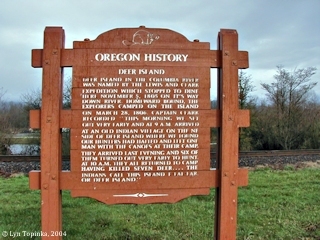 An OREGON HISTORY sign about Deer Island is located along Oregon Highway 30 near the small community of Deer Island. "... Deer Island in the Columbia River was named by the Lewis and Clark Expedition which stopped to dine here November 5, 1805 on it's way down river. Homeward bound, the explorers camped on the island on March 28, 1806. Captain Clark recorded "this morning we set out very early and at 9 a.m. arrived at an old Indian village on the NE side of Deer Island where we found our hunters had halted and left one man with the canoes at their camp. They arrived last evening and six of them turned out very early to hunt. At 10 a.m. they all returned to camp having killed seven deer ... the Indians call this island E lal lar, or Deer Island." 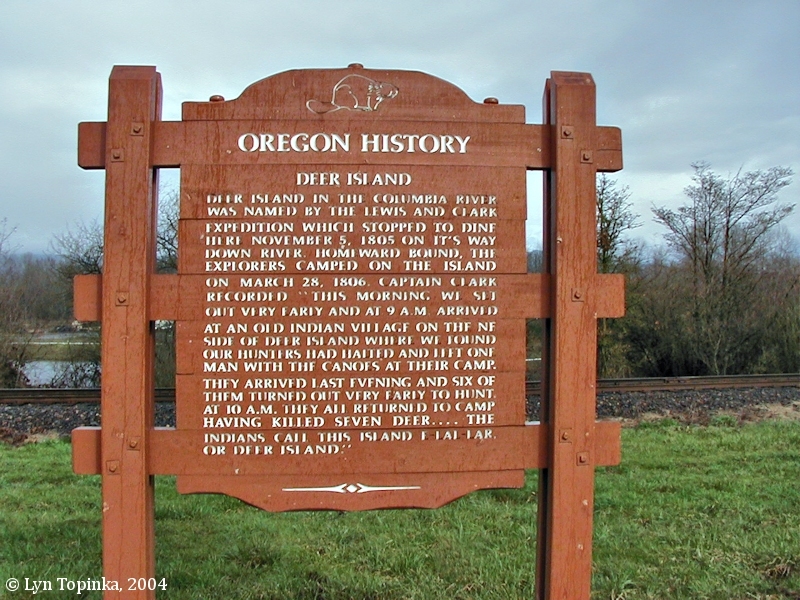 ..."
Click image to enlarge Deer Island Historical Sign, Oregon. 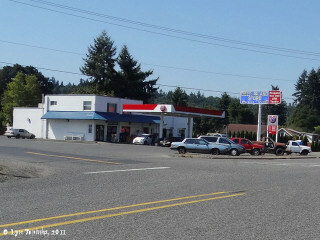 Located along Oregon Highway 30 at Deer Island. Image taken February 28, 2004. Today the 16-mile-long Tide Creek is a tributary of South Deer Creek Slough. Historically, the lower 2.2 miles of Tide Creek flowed north parallel to Deer Island Slough before entering the Columbia River west of the north confluence of Deer Island Slough. This was once the location of a small community called Hunters and a ferry terminal for the Northern Pacific Railroad. 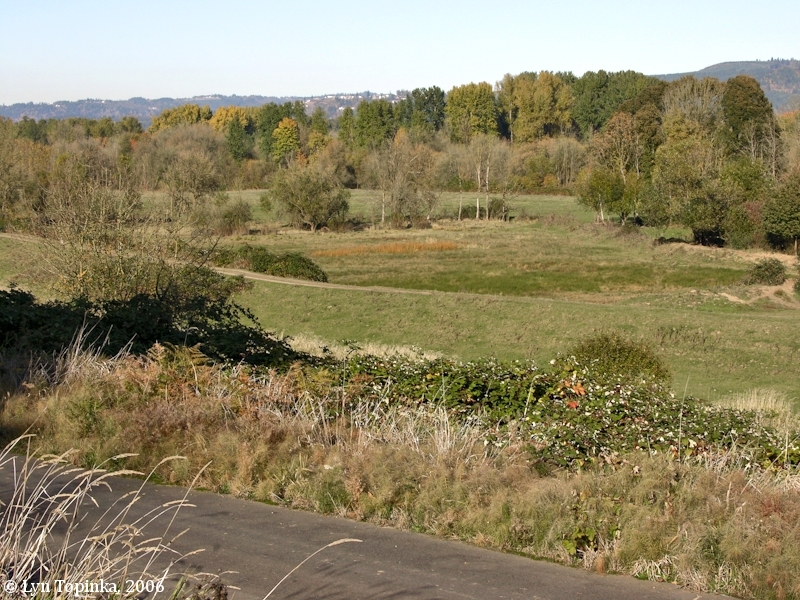 Today however lower Tide Creek has been diverted from its historical floodplain into a constructed channel flowing south and then east before entering South Deer Island Slough at a point 2.5 miles upstream from the Slough's confluence with the Columbia River. According to Oregon Geographic Names (McArthur and McArthur, 2003), the name "Tide Creek" is very old and most likely resulted from the creek showing tidal influences. In 1902 the Tidecreek Post Office was established. In 1903 the office closed and moved to Goble. In 1912 the Tide Creek Station was established by Burlington Northern. Click image to enlarge Tide Creek, Deer Island, Oregon. View from moving car heading north on Highway 30. Image taken January 11, 2013. We set out early this morning and proceeded along the side of Deer Island [Deer Island, Oregon]; halted at 10 A. M. near its upper point and breakfasted. ... the upper point of this Island may be esteemed the lower side or commencement of the Columbian valley.